Venue:Zahur Ahmed Chowdhury Stadium, Chittagong. Lowest Defended: 177/10 (46.1 Ov) by PAK vs BAN. Mushfiqur Rahim (wk), Mashrafe Mortaza (c), Liton Das, Imrul Kayes, Fazle Mahmud, Mohammad Mithun, Mahmudullah, Mehidy Hasan, Mohammad Saifuddin, Mustafizur Rahman, Nazmul Islam, Rubel Hossain, Abu Hider Rony, Ariful Haque, Nazmul Hossain Shanto. 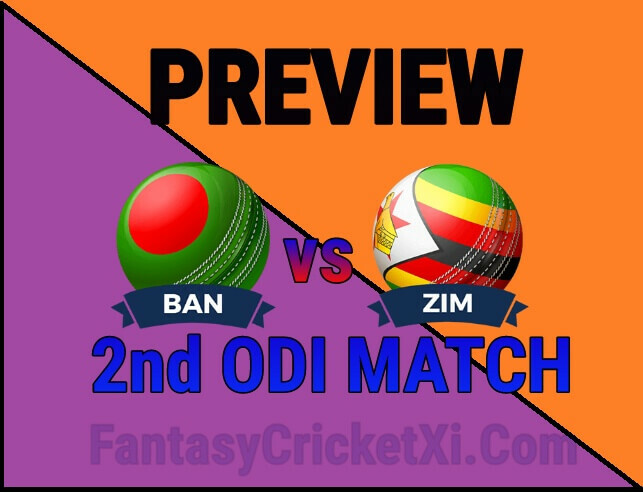 Hamilton Masakadza (c), Brendan Taylor (wk), Cephas Zhuwao, Craig Ervine, Sikandar Raza, Sean Williams, Peter Moor, Donald Tiripano, Brandon Mavuta, Kyle Jarvis, Tendai Chatara, Solomon Mire, Elton Chigumbura, Richard Ngarava, John Nyumbu, Wellington Masakadza, Tarisai Musakanda. ➤ Bangladesh Won Last Match, Their All Team Performed Well, So Players Confidence Will Be High. ➤ In The Last Match Mainly Imrul Kayes (144), Mohd. Mithun (37 ), Mohd. Safuddin (50) Runs Scored. ➤ And Bowlers Aslo Performed Well Mehidy Hasan (3), Nazmul Hasan (2) Wickets Took. ➤ In The Last Match Mustafizur Rahman Suffered From Injury He Gets Fit Test Before Match If He Fit Then He Will Play. ➤ Zimbabwe Bowlers Performed Very Very Well In Last Matches, No Batsman Played With Responcibilty. ➤ In The Last Match Kyle Jarvis (4) Wickets Took And 37 Runs Scored.Cephas Zhuwao (35) Sean Williams (50) Runs Scored. Opener : Liton Das With Imrul Kayes. Middle Order : Mustafiqur Rahim, Mohd. Mithun, Muhmudullah, Mohd. Saifuddin, Mehidy Hasan. Fast Bowler : Rubel Hossain, Mashrafe Mortaza, Mohd. Safuddin. Spin Bowler : Mehidy Hasan, Mahmudullah, Fazle Mahmud, Nazmul Islam. Opener : Hamilton Masakadza With Cephas Zhuwao. Fast Bowler : Tendai Chatara, Kyle Jarvis, Donald Tiripano. Spin Bowler : Brandon Mavuta, Sikandar Raza, Sean Williams.